While bridal magazines would like you to believe that your perfect wedding will take nothing less than an army of consultants, caterers, other professionals and their staff, most couples getting married now would tell you that they want their wedding to be something unique, memorable, and fun. Their wedding is supposed to be the happiest day of their lives, and they want that special day to reflect who they are, and turn it into a celebration of their love with their friends and family around them. Having a unique and memorable wedding takes a little bit of planning and a lot of work but the results are worth it. Put these five items at the top of your to-do list and save the date. Make those invitations pop. Who says that all wedding invitations have the same? It’s your wedding and should reflect your unique style and your joy at being together. Personalized contemporary wedding invitations can be the first step in creating your wedding day in your own style. Everyone does roses and baby’s breath. Make your bouquet and wedding flowers reflect your own sense of style. From lilies to sunflowers, a professional florist can create a theme for your wedding that will be uniquely your own weather it is modern minimalism or over the top everything in pink. Brides may not know this but the people that they hire are sometimes the most important people to tend and listen to. Although there is a stigma that you are the boss, take a moment and listen to them. For example, when choosing a photographer or a photo booth vendor for your wedding, be sure to ask how many weddings they’ve been to. An experienced and highly reputable vendor can contribute many ideas that can be an asset to your big day and make your day the best it can be. Try not to lose sight of just resorting to your friends and family for advice, the people you hire are also a great resource to ask for ideas that will make your wedding unique. Some brides feel that throwing the bouquet puts their single friends in an uncomfortable position. Instead, give your flowers and the groom’s boutonniere to the couple at the wedding who has been married the longest, or share all the flowers equally among the bridesmaids. Personalize your cake. You don’t have to stick with white frosting on a white cake. Wedding cakes can have any kind of color and motifs, not to mention flavors like chocolate, strawberry, or even red velvet. Fondant icing can be colored, cut, shaped, and textured to create something just for the two of you. Add in a cake topper with a personal meaning for you both instead of the wax-faced figurines, and don’t forget the groom’s cake! And if you absolutely can’t stand the thought of wedding cake, why not try wedding cheesecake? Talk to your caterer about your favorite foods. How many times have you eaten rubbery chicken or bland beef? There is no reason that food at your wedding has to be anything other than what you love to eat on your perfect food days. Or maybe there is a decadent treat that you've been wanting to try but haven’t. Your wedding is your day, not anyone else’s. You are marrying each other, not your guests, nor anyone else’s expectations. This is a celebration of your love and commitment to each other as well as a party will always want to remember fondly. Yes, it’s a milestone, but it is also the beginning of your lives together and you should celebrate that in your own time, in your own style, and for yourselves first and foremost. This past weekend, we were fortunate enough to be a part of Emma's first birthday in Milpitas, CA. She had a circus-themed party, which included Photo Bomb, a taco caterer, a bounce house, and face painters! It was a great time with awesome friends and family, great food, and cute pictures! See a few of our favorites below, as well as our Flash Bomb video for Emma. 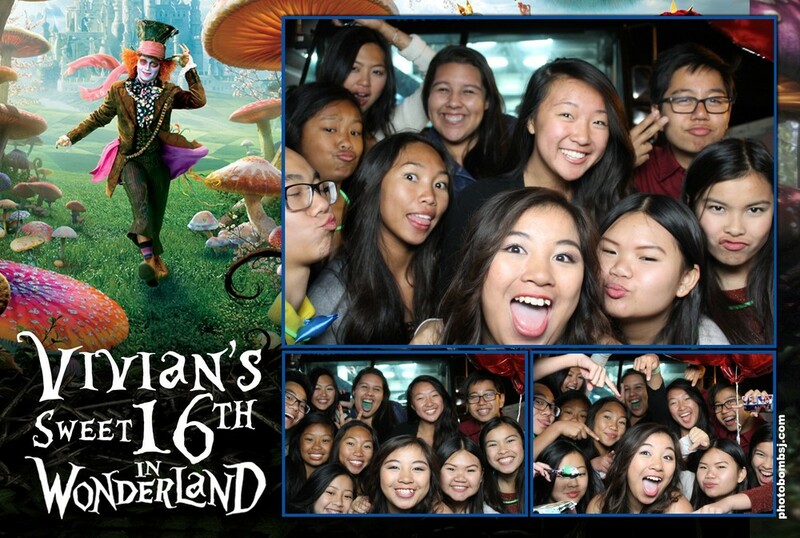 Last night, we were fortunate enough to be a part of Vivian's Sweet 16th Birthday Party. 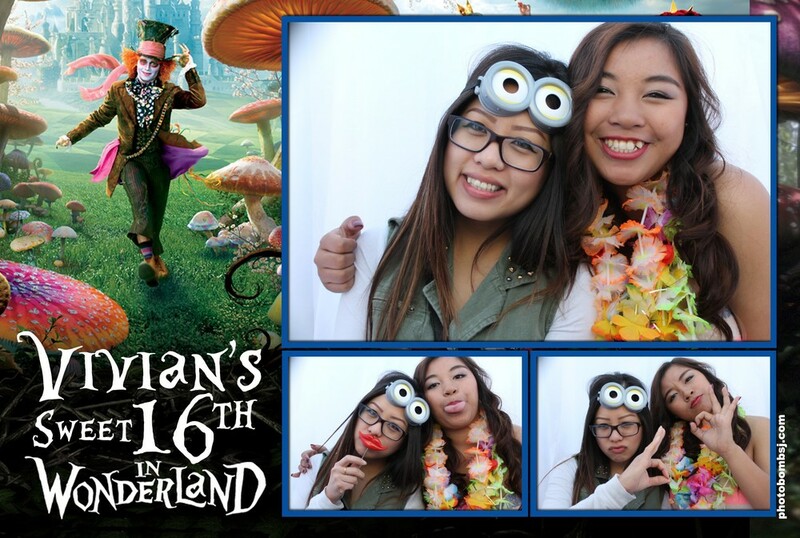 She chose to have an Alice In Wonderland theme, which was amazing. The outdoor party included a dessert table, a decorated gazebo, and the Paddy Wagon Sliders food truck. Needless to say, we think the guests loved having our photo booth there. We created two different designs for this party. Check out a few of our favorites below, as well as our Flash Bomb video for the night! We were fortunate enough to be a part of San Jose's Cinequest Film Festival this year. 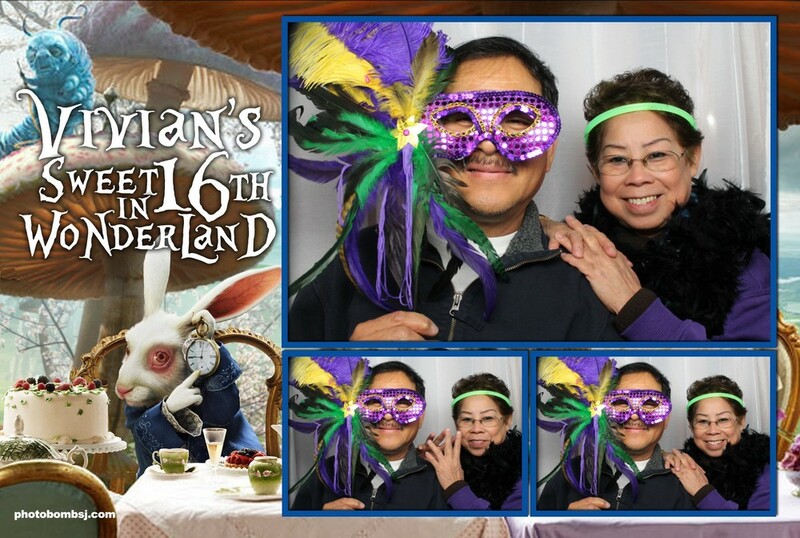 We provided photo booth services at both the opening and closing night parties. Please feel free to check out the galleries and also our Flash Bomb video of the night below! 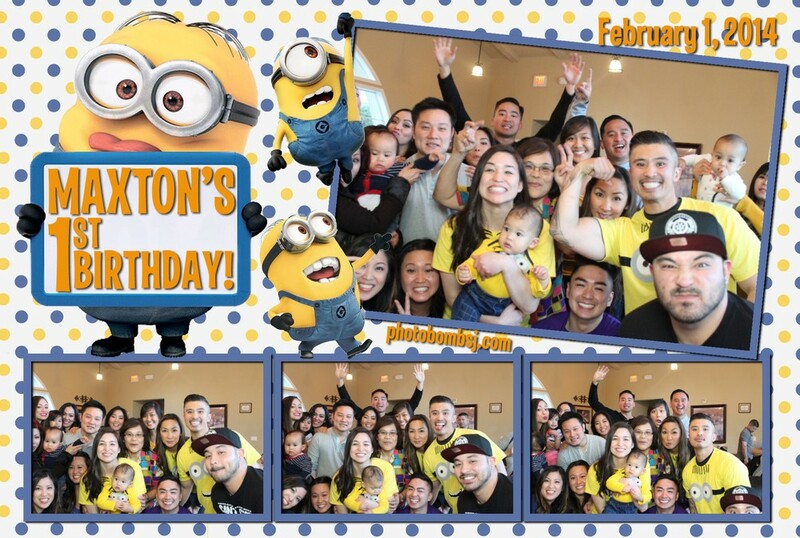 Yesterday, Photo Bomb had the pleasure of being a part of Maxton's 1st birthday party, which had a Minion theme from Despicable Me. 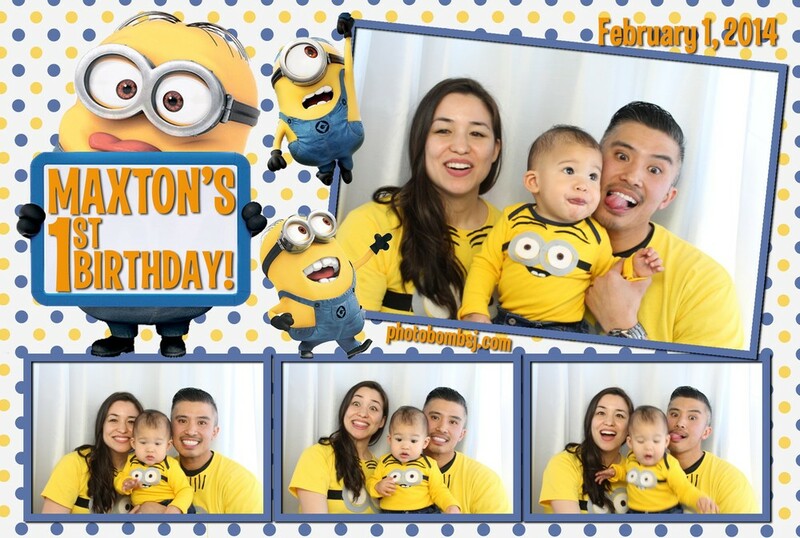 Everything looked great: Minion shirts, decorations, cakes…pretty much Minion everything! Maxton's parents sure know how to throw a party! They had a taco lady and a balloon animal maker working the party too. 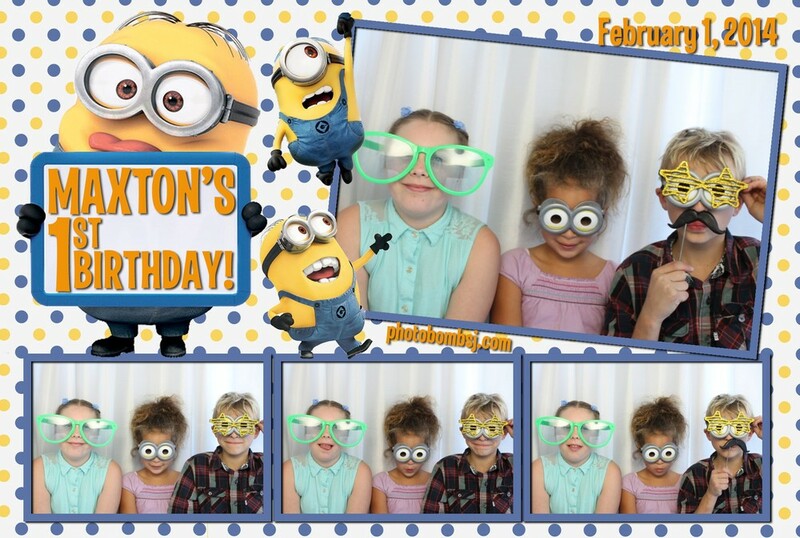 We think it's safe to say that Maxton's guests enjoyed having the Photo Bomb photo booth there. Check out some of the photos below, as well as a mini video we made for Maxton! Thanks for letting Photo Bomb be a part of your special day!